What is Michigan's freshman quarterback Shane Morris going to do? Michigan and Kansas State are both facing one major question as they prepare for Saturday night’s Buffalo Wild Wings Bowl. 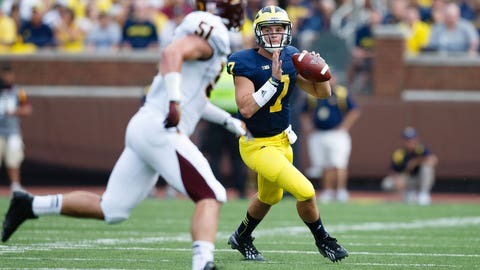 What is Michigan’s freshman quarterback Shane Morris going to do? Kansas State is trying to prepare for a quarterback who only threw nine passes this season, all in mop-up duty, while the Wolverines try to prepare a game plan for a player with different strengths than Devin Gardner. Even minor differences can have an impact — Morris is a lefty, which means Michael Schofield has the key role of protecting his blind side, a job that has belonged to Taylor Lewan for both Gardner and Denard Robinson. "My prestige has kind of gone out the window," Lewan joked at a press conference in Phoenix. "He has the potential to be an extremely good player, and now he has an opportunity. If he stays confident, he’s going to be very successful." While Gardner has been most dangerous while making plays on the move, Morris is a more traditional drop-back passer with a big arm. "There’s no way I can guess how they are going to use the young man — we can’t define tendencies based on the information we have," said Kansas State coach Bill Snyder. "We just have to prepare for their offense and the ten players that we have have seen play." Gardner injured his foot during the Ohio State game, but stayed in the game to come within one two-point conversion of leading Michigan to an upset victory. The initial diagnosis was turf toe, but later reports suggested that Gardner may have broken his foot. "That’s what they are worried about — slight fractures and that kind of stuff," Michigan coach Brady Hoke said. "I don’t know. They’ve x-rayed it a couple of times and MRI’ed it. It’s probably more than just turf toe." For a long time, this season had been planned as Morris’ grand entrance onto the college-football stage. With Robinson graduating and Gardner moving to wide receiver, everything was set for the five-star recruit to take over the program on his first day in Ann Arbor. Offensive coordinator Al Borges even prepared to move the Wolverines to a pro-style offense that would be a better fit for his skills. Everything changed when he developed mononucleosis early in his senior year at Warren De La Salle High School. Not only did the illness cost Morris most of the season, but it kept him from taking early enrollment at Michigan in January. That meant no spring practice with the Wolverines, and with Gardner having moved back to quarterback last season after Robinson’s injury, Morris had no real chance of earning the starting job. He might have even started the season as the third-string quarterback, but Russell Bellomy missed the year with a knee injury. Morris beat out fellow freshman Brian Cleary for the No. 2 job, and saw limited action in blowouts. He faces a tough test against a Kansas State pass defense that ranks in the nation’s top 25. Four-year starter Ty Zimmerman leads the defense at safety, and Ryan Mueller is one of the country’s best pass rushers, so Michigan will have to run the ball in order to take pressure off Morris. That’s something they have struggled to do all season, and it might come down to how well the coaching staff can improve the offensive line with a month of bowl practice. Offensively, Kansas State is a running team built around tailback John Hubert and quarterback Daniel Sams, who have combined for more than 1,700 yards on the ground. Sams, though, isn’t much of a passer, so Snyder will go with Jake Waters when Kansas State needs to throw the ball. Tyler Lockett is the biggest receiving threat, having put up 1,146 yards and eight touchdowns despite being limited to 11 games by injuries. With an inexperienced quarterback and a struggling rushing game, the Wolverines aren’t likely to light up the scoreboard, and Hubert and Lockett give the Wildcats big-play potential. That could add up to a long night for Michigan fans, especially with the game starting after 10pm local time, but in the long run, it will provide important experience for Morris.